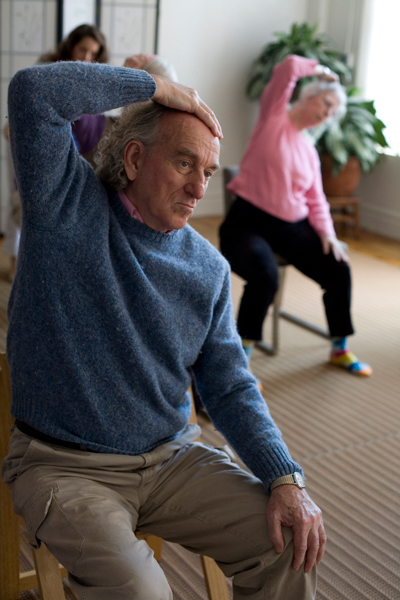 In group Awareness Through Movement® (ATM) lessons, the Feldenkrais practitioner verbally leads you through a sequence of movements in basic positions: sitting or lying on the floor, standing or sitting on a chair. These precisely structured movement explorations involve thinking, sensing, feeling, moving, and imagining. By increasing awareness, you will learn to notice habitual patterns of movement and develop new alternatives, resulting in improved flexibility and coordination. Many lessons are based on developmental movements and ordinary functional activities (reaching, standing, lying to sitting, looking behind yourself, etc.). Some are based on more abstract explorations of joint, muscle, and postural relationships. There are hundreds of ATM lessons, varying in difficulty and complexity, for all levels of movement ability. A lesson generally lasts from 30 to 60 minutes.
" Life is a process. Improve the quality of the process and you improve the quality of life itself. " Each class has a different registration process and pricing. Please contact me for more details prior to attending your first class. "What I'm after isn't flexible bodies but flexible brains. What I'm after is to restore each person to their human dignity."